…the electricians should be there right now. I’m on my way over there for another walkthrough. Looks like this flip might finally get completed after all! Love that door color! How very exciting that your flip is almost complete. I can’t wait to see the final pictures. So glad things are coming together for you guys! Loving the color combo from the pic you shared…so pretty!!!!! Good luck with everything! Yay! 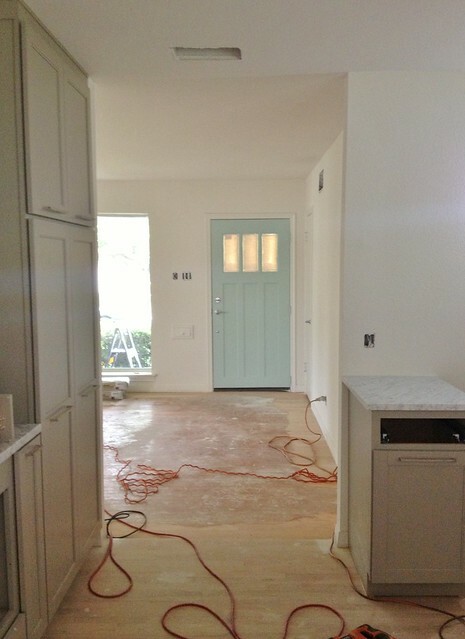 Also – I love that door color, too….what is it?? Thanks! The door color (inside and out) is Sherwin Williams Waterscape (6470). Conveniently, they are having a 30% off sale this weekend…. thanks! That door color is beautiful with the greeny-grey of the kitchen! Martha Stewart would approve!!! LOVE, LOVE, LOVE the door and the color! This looks like it is coming along great! Thanks for sharing! I feel light headed just seeing that door. Oh my gosh, it’s going to look amazing with the grey. Gorgeous! What a relief. Sometimes venting really is the answer to your problems. Glad you got the electrician (and every other) thing worked out.